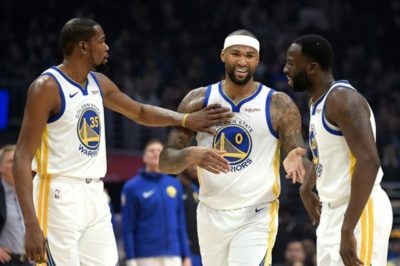 Demarcus Cousins is back for the Warriors, making them potentially unbeatable while George and above all Harden are making the show with historical numbers. After going 12-10 between November and December, the Warriors are on a 12-1 run and have no will to stop now. Their only loss emphasized their lack of a true big man as Capela collected 29pts in 21rbds for the Rockets. Since then, Cousins has started his season, adapting pretty well with 13.5pts 7.3rbds 3.5as in 21min, bringing that much needed inside presence. Golden State has won its last ten games. Since December 22, Denver has lost all its games away from home against playoffable teams of the West, even losing against Phoenix in the process. Torrey Craig seems to be the weak link at SF with 4.5pts on 0/8 combined over the four losses of January desplite playing an averaged 28min. Jamal Murray and Millsap has been the other weak links as in three of those four January losses, they has shot under 40% from the field. The Nuggets need to be scarier against their potential playoff opponents if they don’t want to leave the competition early. With 10-8 since Christmas and home losses against Minnesota (twice), Washington or the Lakers, OKC could have started 2019 better. With an averaged 127pts scored by its opponents in the five losses of January, the Thunder knows what it needs to improve. Offensively, PG13 has reached the 30pts bar seven times in thirteen games while Ferguson has finally been consistent with at least 8pts in nine of his last ten games and averages of 10.8pts on 48% from three for the month. With 13-7 since December 22 including wins against Golden State and Houston, the Blazers have been pretty solid. One opponent they will have to avoid is OKC as they lost both games of the month against the Thunder. Nurkic has been on a tear recently with 18pts 10.6rbds 3.6as 2.8bl over the last five games, albeit on a low 44%, while McCollum went triple double (28pts 10rbds 10as) against Atlanta as Lillard was injured. James Harden is a legend!! Twenty three games with 30pts or more, 44pts average for the month and already eighteen games with 40pts or more, Harden is a legit MVP candidate and may be the first to average 36pts per game since Jordan during the 86-87 season. That has not been enough to dominate opponents as Houston has been 7-5 since January 6. The signing of Faried (14.3pts 9.5rbds in four games) brings a much needed four but Houston will still have to wait several weeks for Capela. After winning five in a row including wins against the Clippers, Boston and Toronto, the Spurs have struggled recently with five losses over the last ten games including defeats against Charlotte, the Clippers or Memphis. DeRozan has been cold with only 16.4pts on 41% FG for the month and five of his ten games under 40% with, very bad numbers when you consider he hasn’t taken any shot from three. February will be tough to handle as San Antonio is 7-14 away from home and will play eight games away, mainly due to the Rodeo Road Trip, including tough matchups against Golden State, Toronto or Portland. An easy schedule has allowed Utah to win nine of its last ten games, including a home win against Denver, and go from 20-21 to 29-22. During this stretch, Mitchell has been the main factor as he has been the best scorer in each game, averaging 28pts for the month on 41% 3pt, far better numbers than his 22pts season average on 33% 3pt. He recived help from Gobert who is averaging 15.9pts 15.3rbds and 2.7bl over the last ten games. With away games at Portland, Golden State and OKC, February will be more demanding for Utah. After a good start this season, the Clippers have endured several streaks of losses including a five-game losing streak before winning the last three games. With two home games against Atlanta and the Lakers before six away games, that may not change a lot. With 9pts 3as on 36% over the last ten games, SGA has kind of hit a rookie wall. He will have to show more consistency to help his team reach the playoffs. Previous Previous post: 2019 NBA Mock Draft #4 : Is talent superior to need?